But time is not on her side and neither is good luck. Her baby is crying for hours every night, her husband’s restaurant is so popular he’s never around, and her new house is in jeopardy of never being built. Mei doesn’t have the energy to help with a murder investigation… or does she? I love this series and it’s one of my favorite cozy mystery series, so I was excited to start reading this one. 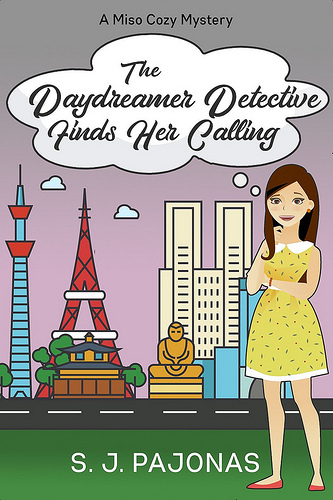 The Daydreamer Detective Finds Her Calling is another awesome installment in this series. I love seeing how Mei and the other characters change and progress throughout this series. And as the title suggest this one is quite an important book in Mei’s journey. Mei has a lot to deal with in this book, the saying when it rains it pours certainly came to mind. Not only is her baby crying for hours every evening, her hired help at the tea shop is stopping soon, her house is a mess, her husband’s restaurant is more busy, there are troubles with their new house that’s being build, she hardly gets any sleep or free time and then there is a new mystery that Mei gets involved in. All in all it was quite the eventful read and I enjoyed seeing how Mei dealt with everything and I also felt so bad for her with all the stress she’s under and everything she has to deal with. I really enjoyed this book. It nicely gets split between Mei’s personal struggles, the strange happening at the house and the mystery. The mystery starts a bit later, but I think it worked well here. And the three main topics all nicely got blended together. I like reading about Mei’s personal life as mcuh as the mystery, so it definitely works here to have quite a bit of focus on that. The mystery was an interesting one, I wans’t as invested as in some other books in this series, but I still really enjoyed reading about it and seeing how they figure out what happened. For a long time it doesn’t seem to get much clearer what happened, until suddenly new evidence and clues pop up and then it slowly starts coming together. I liked how it all came together in the end. I also liked how this tackles Mei’s involvement with the mystery, it’s very natural and I like seeing how she helps with the investigation. Then there are the strange happenings with the new house that is being build. There are accidents happening, things beings moved, people see something moving at night and holes appearing where they were none before. Mei and Yasahiro just want their house build, but the crew that works there is terrified it’s haunted and they have to solve this before the work starts up again. I really liked this plot line as there were all these strange events and I started wondering if it really was haunted or if something else was going. I especially liked the conclusion as it was such an interesting turn. Although I did end predicting what was going on slightly before Mei made that guess, but that’s because of something the author said on her blog and I suddenly pieced things together. It was a great twist. I also liked reading about everything that’s going on in Mei’s life. How she struggles with everything, but also how she slowly finds a way to deal with. She has some trouble accepting help or asking for it on other cases, but I liked how eventually she realized it’s not a weakness. I have to admit I am not a fan of babies in books, but even so I really enjoyed this book and while the baby is part of a lot of scenes I didn’t mind as much, although I’ll be happier when the baby is a bit older. I think Mei is a great character and her struggles also feel very realistic. By the end of the book I really liked where she was and where she’s going with her life. I can’t wait to see what will happen in the next book. There isn’t as much Mei and Yasahiro time in this book, but I did like how they are a unified font and do things together. They’re just so busy with everything going on that they don’t have as much time for each other. The scenes they have together are great and they are sprinkled throughout the book as little pieces of happiness. There’s this scene where Yasahiro stands up for Mei that was awesome and also toward the end where you really see the cozy family they’re all becoming. There also is a great cast of recurring side characters like police officer Goro and his wife Kumi, Police officer Kayo, Mei’s mother and some returning customers at her tea shop and also new side characters like Emi who helps in the tea shop, the characters involved with the mystery and some characters who work on the house. And the author does a great job giving them all their own personality too. To summarize: I love this series and this is another great read. Mei has so much going on in this book with busy things in her personal life like her baby and work, a mystery to solve and strange happening at their new house that’s being build. It all blends together to form an engaging story and I just wanted to keep reading and find out what was going on. The mystery was well done, with not many clues at first, but slowly more clues popping up and things slowly coming together. The house story line also was interesting and I especially liked the conclusion to that, although I did manage to predict what was going on. I really like where things are going in Mei’s life and especially how her involvement with the mysteries is going and how she finds her calling in this book, I can’t wait to see where that goes in future books. All in all I can’t recommend this series enough to cozy mystery fans and it remains one of my favorite cozie series. What’s the last book you read that took place in another country? I think it’s neat how this mystery series has a married detecting pair and it includes family life and connections. The mysteries at the house that seem to be a haunting sounds fun. I really need to give this series a go. I do like that its set in Japan. Oh actually her husband is a chef and not helping with the detecting. They are a great couple tough. The family connection and the friends they have really add to the series. The mystery at the house was quite spooky and fun. I hope you give it a try, I would love to hear your thoughts about it. I love this series and this book was so good. Can’t wait for the next one!